Except that the man in the middle of the latest Concacaf shenanigans, the unfortunate Mark Geiger, is not one of the usual suspects in the kind of by-play that the confederation has been associated with in recent years. As a member of the Professional Referee Organization (PRO), Geiger is supposed to be part of the solution to some of the vagaries of soccer in the region, and it was a major officiating own goal for both him and PRO that he was caught up in the middle of the Mexico v Panama Gold Cup semi-final furore that brought no credit to anyone involved. The previous Mexico game – their quarter-final with Costa Rica – also turned on a decision by a PRO member, in this case assistant referee Eric Boria, who flagged for an equally late and dubious penalty that helped El Tri to progress. At the same time, a less publicised decision saw Cyle Larin’s red card from the previous weekend rescinded. The Orlando striker had been dismissed by another PRO member, Fotis Bazakos, during the game with New York Red Bulls, a decision that incensed City head coach Adrian Heath. 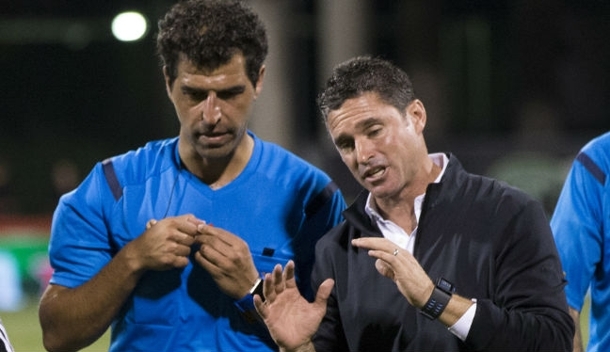 In overturning the red issued by Bazakos, the appeals committee put PRO in the crosshairs of a debate that possibly signifies the true coming-of-age of MLS: are the referees up to the job? PRO chief Peter Walton insists the officiating is keeping up with the league’s growth. He is also keen to create more dialogue, and points out his organisation already holds training camps every two weeks to which all coaches are welcome. “I would definitely like to see coaches interacting more with our referees off the field,” Walton said. “There is an open invitation for any coaching staffs to attend our training camps to improve standards and a number of coaches have taken that opportunity. It could be more, though. Walton is not unduly concerned with the increase in red cards and is fully supportive of individual referees like Baldomero Toledo and Sorin Stoica, who have a much higher red card rate than most of their PRO colleagues. “I don’t think there is a great issue with the number of cards being issued,” Walton insisted. “I think it is only a few clubs who are suffering. Before we start looking at the refereeing, we might look at what the cards are being issued for. I think some players are still approaching the game as it was 10 years ago and they need to wise up about certain types of tackles. Walton says the development of PRO is goes hand-in-hand with the development of MLS itself. There may be occasional growing pains – Geiger’s recent Gold Cup experience, for example – but his European perspective stands him in good stead. He concluded: “When I came here in 2012, there wasn’t any establishment looking after referees. So there was nothing here to build on. I put into place a full referee organisation and I have a 10-year mission we are a third of the way through.